You probably know that a library is a haven. 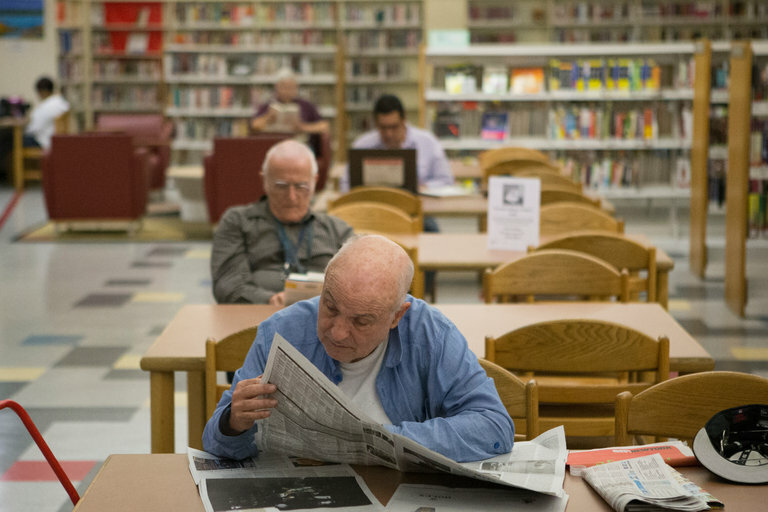 But in case you didn’t, here is a story about what libraries mean to New Yorkers these days. Winnie Hu writes at the NY Times, “Matthew Carter’s summer hideaway … does not require a car ride or a small fortune to keep up. “Mr. Carter, 32, an adjunct professor of music at the City College of New York, simply holes up at the Inwood Library in northern Manhattan with his research books. It is quiet, air-conditioned and open every day. “A recent contest to recognize neighborhood libraries underscored their vitality: 18,766 online and paper nominations were submitted in one month, up from about 4,300 when the yearly competition was started in 2013. Nearly every library was nominated at least once. Some received hundreds of nods. “One young man wrote that he was homeless when he started going to the Arverne branch of the Queens Library, where the staff not only helped him study to become a security guard but also hired him to work as a mentor to teenagers. Today, that man, Richard Johnson, has two jobs and his own apartment. “The recent gains by libraries have delighted Christian Zabriskie, a librarian and executive director of Urban Librarians Unite, an advocacy and education group that organizes an annual ‘read-in,’ in which people take turns reading nonstop for 24 hours, to support the libraries. The Inwood Library in northern Manhattan is quiet, air-conditioned and open every day. Isn’t this the best?! And I love that the librarians embrace the role, rather than being wigged out that the homeless, etc., are hanging out there. My weekly sewing group meets in the lovely meeting room/kitchen of a tiny library near here! I’m a recovering book purist. I once thought libraries were moving away from books too much, but now I see the importance of meeting everyone’s needs. And it’s obvious that books are still with us as long as we want them.